I suffer from major craft ADHD. I jump from project to project and I can't seem to complete anything because a new idea pops into my head that I just have to start. I guess this is better than crafters block (you know, like writers block) but it is turning my craft studio into a disaster zone and my supplies are starting to trickle into the rest of my home...soon they will take over the entire house! I need help before Mr. Designs by Vanessa gets buried in glitter and yarn. Hmm glitter and yarn...that would make for a great new project. See what I mean? I need a craft intervention! 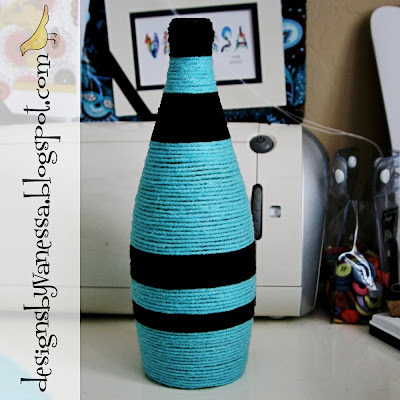 You will need yarn (1 color, 2 colors, 10 colors...this is completely up to you), a bottle of some sort (think upcycling), glue (I used craft tacky glue) and scissors. 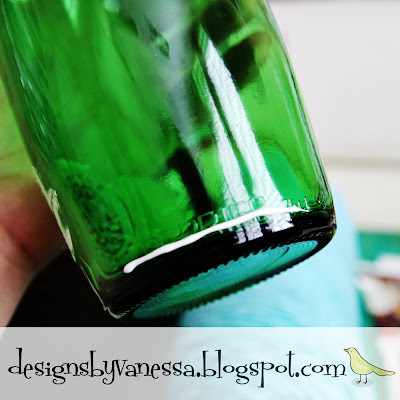 Start by squeezing a thin line of glue along the bottom of your bottle. 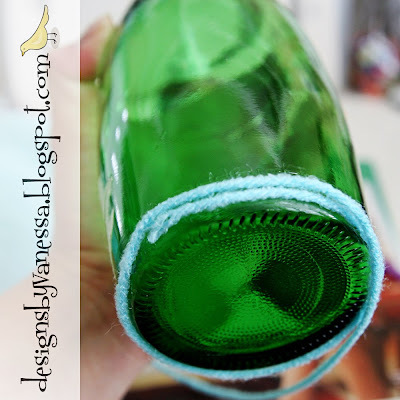 This is an old perrier bottle but you can use old soda bottles, wine bottles, etc. You can even use old jars or containers for a different look, the possibilities are endless. 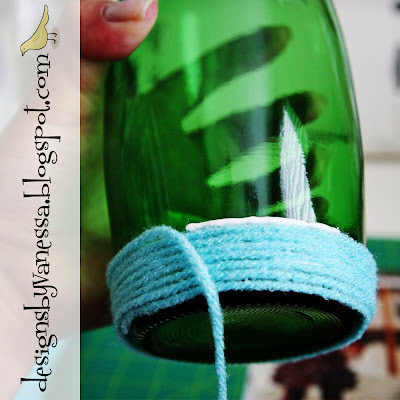 Simply place the yarn on your glue and press down to secure in place. 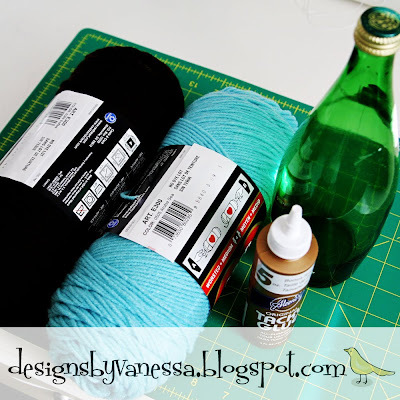 Continue squeezing small thin lines of glue followed by placing your yarn, wrapping up and around your bottle. Make sure your yarn is wrapped closely together to prevent gaps or holes. Keep going, don't succumb to the craft ADHD (this is mainly a pep talk to myself). 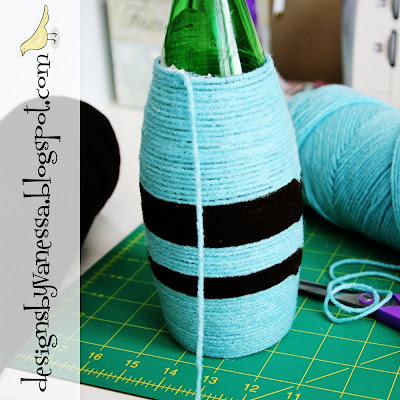 You can switch yarn colors at anytime (that sorta feels like a new project), just glue the start of the new strand of yarn as close as you can get to the end of the old strand and continue gluing and wrapping. 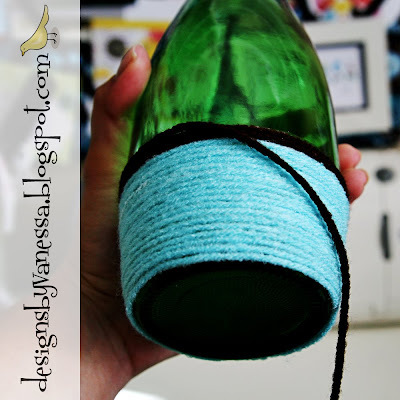 Don't forget to add your upcycled yarn vase photos to the Designs by Vanessa Tutorial Flickr Group so we can all see your finished product! ooh I have tons of leftovers that I'd love to display like this! Imagine how cool that will look with handspun art yarn! Ok, you've just given me gallons of inspiration with just one blog post! Truly awesome idea, and I've got lots of cool-shaped bottles that have been waiting for a destiny! That's really cute! I totally get crafty ADD myself. I have so many projects I'm working on! What a fun idea! I never thought of covering my husband in glitter and yarn! 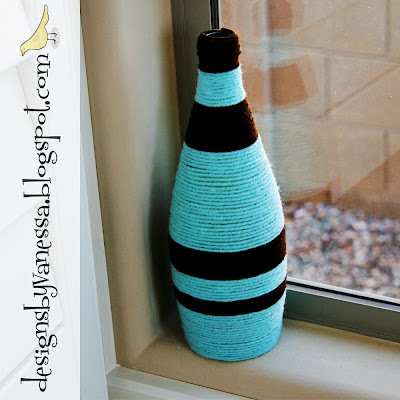 :D The Yarn Vase is great too! thats an awesome idea!! i will try that soon!! Really cute!! Thanks for sharing! I find this idea very amazing.